Hear "live" air traffic controllers working your aircraft and other traffic in real-time settings through all types of airspace. 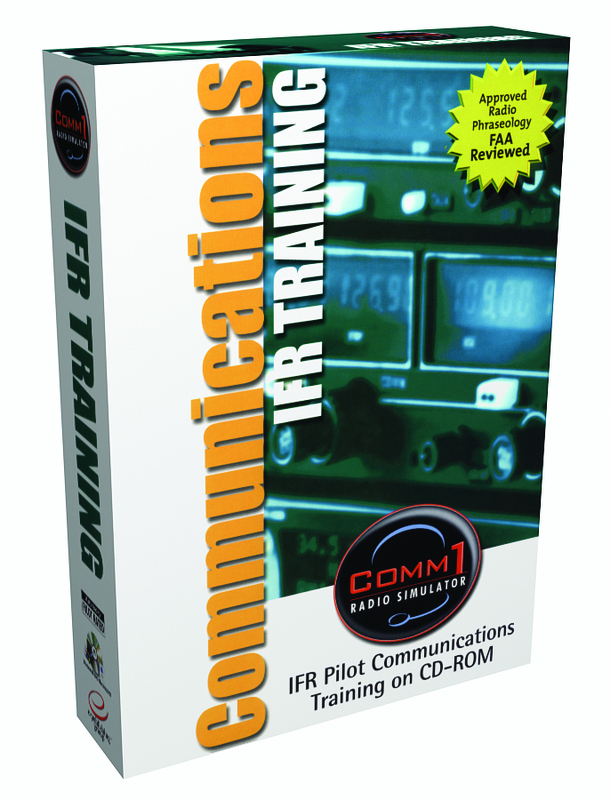 COMM1: IFR showcases the same type of realistic pilot–ATC audio dialogue, detailed flight scenarios, and interactive simulation exercises that have been praised as the winning ingredients of COMM1: VFR Radio Simulator. Record and playback your own radio calls with interactive audio exercises. Operate the on-screen COM 1, COM 2, NAV 1, NAV 2, and audio panel — COMM1 radios tune and respond just like the real thing. Simulate emergency radio procedures from the safety of your desktop. 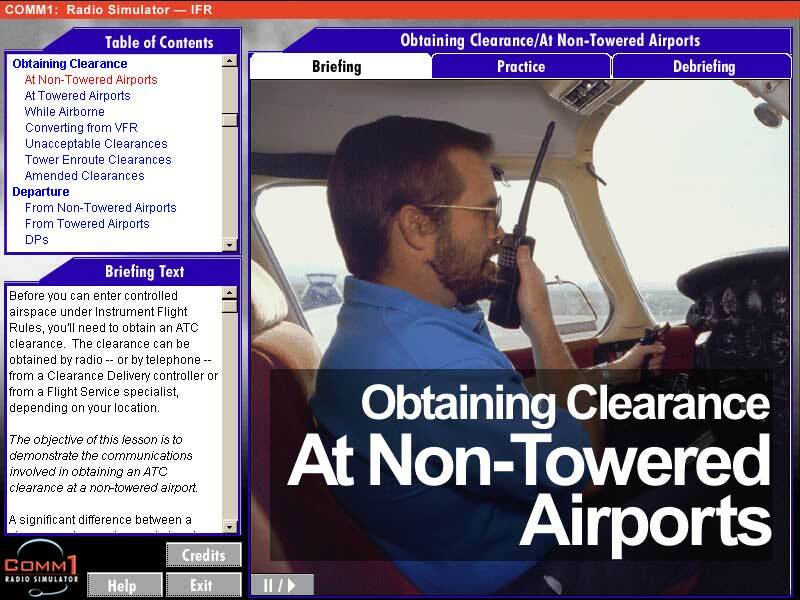 Access the most widely-used aviation resources for frequencies and communication information from the Airport/Facility Directory, AOPA's Airport Directory and Sectional Charts. COMM1: IFR focuses on honing and perfecting radio skills. 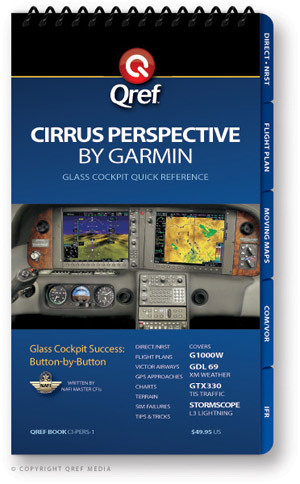 By de-mystifying the "system" through step-by-step audio sequences and breaking down the radio calls that controllers rattle off into definable bits of information, COMM1: IFR helps pilots to become smarter and more confident in the cockpit. And that translates into safer skies for everyone. COMM1 makes radio communications "second nature" for pilots, so they can concentrate on flying the airplane. 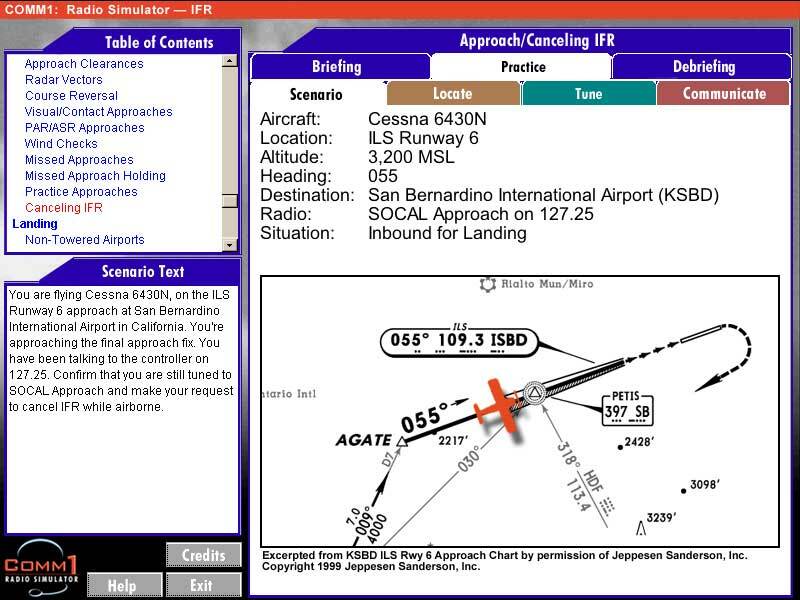 Use actual aeronautical charts, airport diagrams and other visual aids in over 55 communication exercises. Practice unusual IFR situations, such as Radar Approaches, to be better prepared for the unexpected. Hear examples of what you are expected to perform in each lesson. Get expert feedback and compare your responses with the pros. 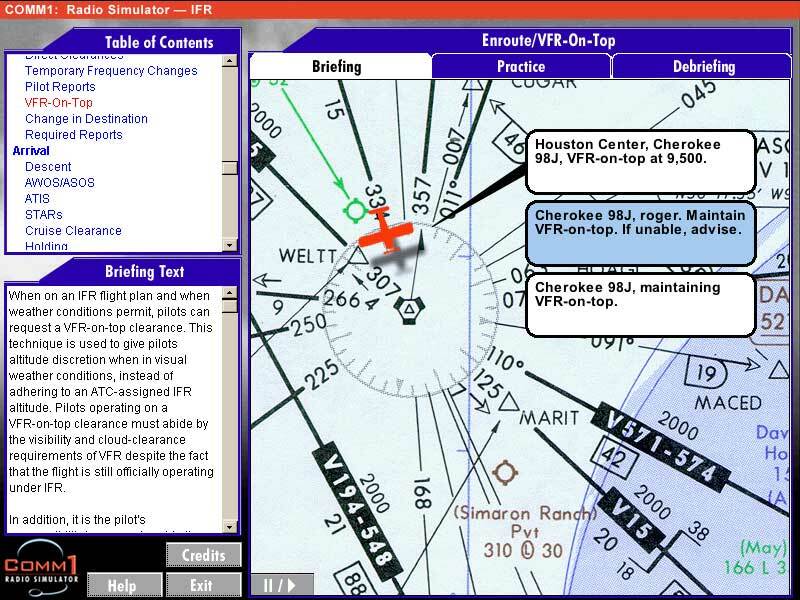 Are You Ready for the Challenge of IFR? 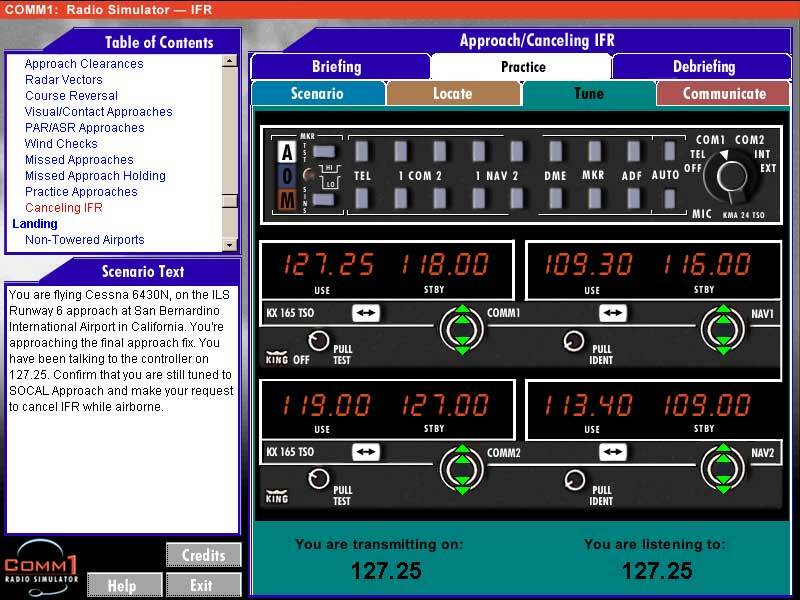 COMM1: IFR challenges the instrument student or refresher pilot to demonstrate proper ATC phraseology and become proficient in their radio skills. Practice with detailed flight scenarios and industry-standard charts while communicating with ATC. Rich visual and audio descriptions of every type of airport, enroute and airspace environment that pilots encounter under IFR, including emergency and equipment outage situations. Interactive conversations with Clearance Delivery, Departure, Enroute, Approach, Tower and Ground controllers are among the 55 simulated exchanges. Comprehensive 9-hour syllabus follows a logical and systematic progression for instrument students learning IFR operations and the many variables that can be encountered at different stages of flight.